Delia Crehan was born in Ireland, immigrated to the United States, and became one of the more popular actresses in Augustin Daly’s company. She later joined John Drew’s Philadelphia troupe and it was a printer’s error there that gave her the stage-name “Ada Rehan.” She was totally devoted to the theater and her profession and never found time to marry. When she moved to London in 1884, she proved equally popular there, adding a number of Shakespearean roles to her repertoire. She was probably best known as Katherine in The Taming of the Shrew or Rosalind in As You Like It. 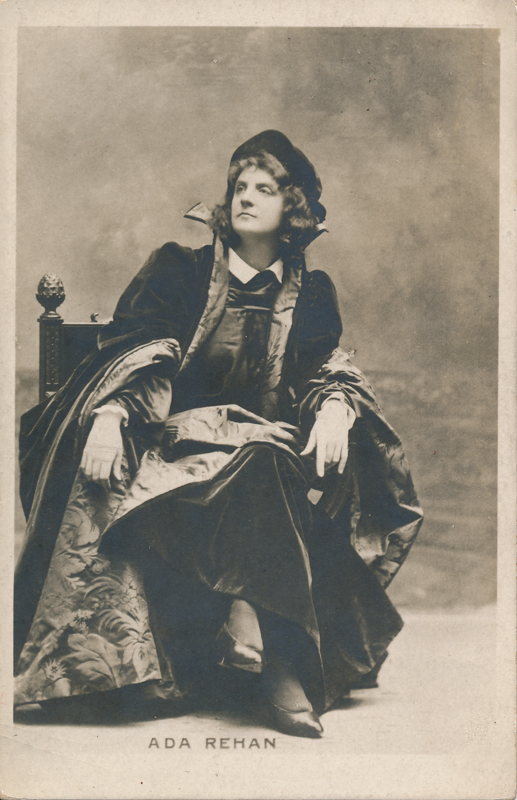 Here, she is pictured as Portia in The Merchant of Venice. She was, in some ways, a victim of the changes going on in the theater at the time. New directors and performance values made her seem increasingly old-fashioned and “Victorian” in style. She retired in 1905 and died eleven years later in 1916.